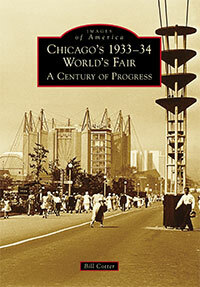 The 1933-34 Chicago World's Fair was truly an amazing event, and I'm glad I was able to share some of my photos in this book. I had fun doing the research and was surprised at some of the things I learned. I hope you will be too. It took six years and cost $100 million, but on May 27, 1933, the gates swung open on the biggest birthday party the city of Chicago had ever seen. The "A Century of Progress Exposition," better known as the 1933-34 Chicago World's Fair, commemorated the amazing progress that had been made since the founding of the city just 100 years earlier. Many of America's largest companies joined with countries from around the world to showcase their histories and advertise their newest products. The road to opening day was not an easy one, with the Great Depression making it look like the fair might never be built, but thousands of small investors stepped forward to help close the financial gap. The fair went on to an unprecedented second season, and when the gates finally closed after the last of the 39 million visitors went home, it had achieved something quite rare among world's fairs: earning a profit. This collection of rare photographs, previously unpublished, highlights the major attractions of the fair and the astonishing changes made between seasons. The price is $19.80 (10% off) plus $7.50 for Priority Mail shipping. International buyers should write for air mail rates as they vary by location. Please let me know if you would like the book signed in any special way, just signed, or left unsigned. The book can also be ordered directly through Amazon. Unfortunately the publisher won't let me match Amazon's prices directly but I will include a copy of one of my Photo CDs from the Fair with each order. You can also order by mail. Orders for the book can also be combined with orders for my CDs of photos from any of the fairs on the site. There's just one shipping charge of $7.50 for any US order of books and CDs. If you have any questions please drop me a note.